The first thing I did upon realizing that I’d be reviewing the MacBook Air for Macworld was sigh heavily and curse my luck. Not that I’m not lucky to get to play with the MacBook Air—I’m excited about that. No, my sigh was one of realization. Realization that my current MacBook was stocked with a 160GB hard drive, a drive that was nearly full. In order to fit my life into the MacBook Air, I was going to have to remove half the data from my hard drive in less than a week. This is the story of my crash MacBook diet. Now that I have a snazzy 500GB Time Machine backup drive, my old clone drive — the 120GB drive I used to back up to via Super Duper! — has been sitting around gathering dust. Now it’s become a place to stash older files that I’d like to have around, but not necessarily right at my side. So I formatted that drive and turned it into a lifeboat of sorts. You will be copying files for approximately 800 years. First into the lifeboat: media files. My iTunes and Amazon MP3 purchases, which have been collecting on my drive since I began purchasing music online, now reside on the lifeboat (as well as on a separate backup device). All the videos on my drive met one of two fates: if they were useless, they visited the Trash. If they were still vaguely useful, they migrated to the lifeboat. The contents of my iPhoto library, likewise transferred to a new home on the lifeboat. All those comic books I have in PDF and CBR formats, ready to be read at a moment’s notice? Slinging webs and battling the Green Goblin on the lifeboat. Next up: the remaindering of old files. I have Macworld (and MacUser, come to think of it) files dating back to the mid-’90s. Yes, I’m a digital pack rat. Besides, you never know when you’ll need that list of potential Eddy Award nominees from 1996! 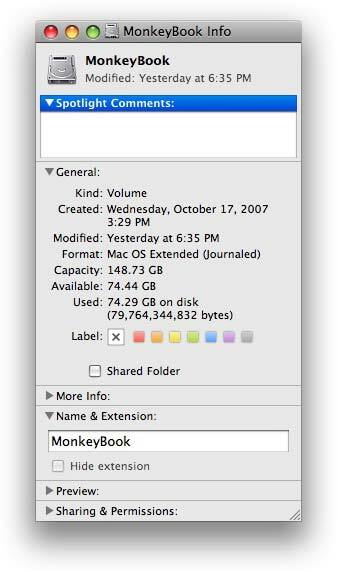 All files in my Macworld Files folder created before 2007? To the lifeboat. My Eudora Folder, containing every mail message I received from 1995 until late last year? Snug in the bow of the lifeboat. The transcript of every iChat I’ve ever had? All but last year’s now reside in the lifeboat. Disabled Fonts, please go to the lifeboat immediately. That HD video I have of David Pogue on the back of a cruise ship, acting like he’s Leonardo DiCaprio and declaring himself “king of the world”? 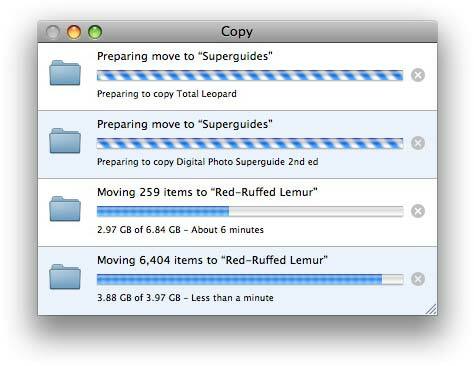 It fared better than DiCaprio's character in "Titanic," and lives today on my external drive. And so it goes. I need to have the master files of all our Superguide e-books around, but they can reside on one of the file servers here at work, not on my local hard drive. With all the old files gone, my next victims were ghosts — programs I downloaded a zillion years ago that still littered my Applications folder. And worse yet, folders in ~/Library/Application Support full of support files for programs that I deleted when the dinosaurs roamed the earth. Unfortunately, that still wasn’t good enough. So I took a walk through my Applications folder and cut any program that I hadn’t used recently, figuring I could always download or install it later if I needed to. Three different shareware utilities that do the same thing? Hello Lostify, farewell Parsley Is Atomically Delicious and MetaX. I also found some horrifically large files in ~/Library/Caches. I believe that files in this directory never get transferred by Migration Assistant during a move to a new system, but just to keep my own housekeeping tally straight, I wiped some gigantic cache folders from programs I rarely, if ever, use. Next stop: the Finder. I type Command-F to bring up a Spotlight window, and then searched for all files with “dmg” in the name. (Yes, searching for Kind is Other: “disk image” would have worked too.) Turns out I have a lot of different software downloads on my hard drive. Almost all of them are freely downloadable, too, meaning I can delete them now and download them again later if I need to. And chances are, most of them have already been surpassed with newer versions, anyway. A quick walk through the search results and I’ve deleted 80 percent of the disk-image files living there. At this point, my drive was approaching 80GB of used space. Unfortunately, an 80GB drive doesn’t actually hold 80GB of data. And you always need room to, you know, download and save files and stuff. So I had more work to do. I was already desperate when I realized that I’ve got a 10GB Parallels disk image sitting on my hard drive. I spent a few moments sobbing quietly to myself. Then I realized I might be able to free up some space by throwing away items within Windows and then running the Parallels Compressor utility. I wasn't sure it’ll work, but it was worth a try. In a MacBook Air world, 10GB for a Windows volume is no longer chump change. Look at all that empty space. I can use it for... nothing. After a few good hours of work, I have come far in my austerity plan. My Get Info window now shows that I’ve used 74.29GB of data, slightly less than half the total capacity of my drive. Will I fit under the cruel storage cap of the MacBook Air? I’m going to hold my breath and hope that I will. If not, I guess I’ll have to fling things overboard randomly in hopes of fitting. In the meantime, using the MacBook Air means I’ll have to make some pretty big changes to how I use my Mac. Rather than listening to music in iTunes from my own hard drive, I’ll either have to use an iPod (I’ve got one at work that’s loaded with the bulk of my library, and when attached it’ll play through iTunes) or take advantage of iTunes Sharing. At home, my entire music collection is shared from another Mac, so I’ll be set. At work, there’s also a nice capacious music server with my library on it, so I won’t be hurting too badly. As for my other documents, I guess I’ll discover soon enough if the inability to access those files on a moment’s notice is a nuisance, a major inconvenience, or simply a subject that never comes up. I’ll never know until I try. As I empty my trash one last time, a final thought occurs to me: at least the MacBook Air we received is one of the models with the 1.8-inch, 80GB hard drive. The solid-state drive option offers only 64GB of capacity. After a few weeks using the MacBook Air, I might achieve such a zen-like state that I can squeeze my life into a drive that size. But if I had to find another 16GB to delete off my drive right now, I suspect my sanity wouldn’t survive the attempt.